Despite the fact that the busiest month of the university year is coming up, plus the A - Z challenge is beginning in just three short days, I have decided to take on something else too. I have always been a fan of arts and crafts and have decided to have a go at making some small items, such as jewelry, hand-painted postcards and other little treasures. I'm not sure how it will work out but I thought I would ask any of you out there who can help me to point me in the direction of some tips on how to make jewelry. I've done this sort of thing before, but I'm unsure about things like where to find chains (also, instructions on how to connect fastenings to chains, whether I have to cut the chains myself, that sort of thing). Any advice would be greatly appreciated! Third of all, this blog is having a severe nordic-lack. 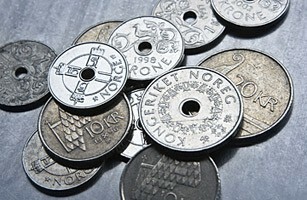 So here is a picture of some Norwegian Kroner, so you can see what their funny hole-y money looks like! Sorry I can't help you out with the crafty stuff. Maternal Unit and Photographer have just gotten into making jewelry, but I asked and they seem to be having the same troubles you are. I think I have the new version. I switched about a month ago. I like that money. Makes me wish there were holes in our coins. Don't you use the Euro? To be honest, I think th Euro needs to be dumped, all countries go back to their own currencies and reinstate borders and the use of passports within the whole of Europe. I loved getting all those different stamps in mine. In Scandinavia they use their own currency still. I really like that they do. It's a shame that they don't give out stamps anymore! Haven't test driven any new interface that I know of, unless I've clicked something by accident. Which is quite possible. As far as the jewellery goes, I can't help personally, but I have a friend who probably can. She makes jewellery and sells it on ETSY and I will ask her. I have not yet tried the new version, but I'm glad to hear it's not too complicated. If anything blogger is complicated, I am sunk. Sigh. Okay, I have switched to it, and I like it. Sigh undone. And about the jewelry honey, I'm afraid I can't be of any help since I'm struggling with the language barrier. Hehe... It's not easy explaining something in English but I'm sure you'll make pretty jewelries!! Thank you so much for the comment and for following. It really means so much! p.s. You are my 99th follower!!! Ohh how lovely! I hope you will make it to 100 very soon! Thank you anyways, I'm sure I will learn quickly. Funny you mention a language barrier since if you hadn't, I wouldn't have guessed that English is not your first language! Yeah... I've been been delaying my upgrade to the new format for as long as possible. Hello, I am the friend that Amanda mentioned, she directed me over to your blog! I craft and I get a lot of my supplies off of eBay. There are a lot of people on there selling things like chains and jump rings for very reasonable prices (although beware if you accidentally order from a seller in China you will be waiting weeks for it to arrive!) If you are after tutorials or even just ideas, I'd recommend checking out www.craftster.org its a great website with message boards split into every kind of craft you can imagine and there are specific jewellery ones including ones where pictures have been posted of items made to a whole board just for people to ask questions and for advice. If you fancy looking me up on it my username is Beki710. I hope this points you in the right direction, send me a message on craftster or on my blog if you wanna know more! for caffeine may be hiding something that is already full of nutrition. I am visiting your website for the very first time and I am already impressed with your post!! good job!! Keep it up!